← Tango the Gardener’s Helper…NOT!! Yesterday Susan and I piled all 4 dogs into the van and we headed out into the country to go to a pottery show/sale. It was nice 80 minute drive on a beautiful, sunny fall day. 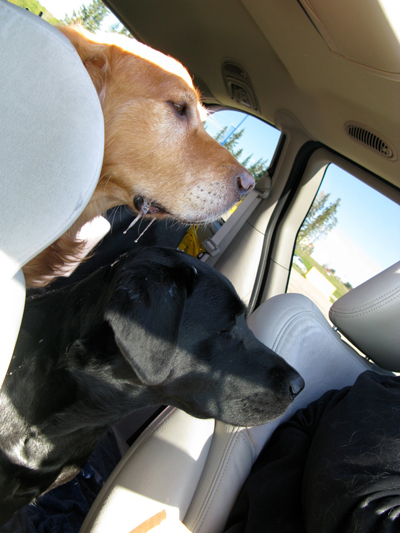 As much as I love my boy’s big, fat head and muzzle….there is one major drawback. Those big jowls hold a lot of spit and poor Hope was the victim. Susan and I were having lunch in the front while Wally and Hope pushed their fat heads between the seat to enjoy the aroma’s. That’s when it started. When Wally smells or sees food he immediately starts drooling…..big steams of spit pour from his handsome jowly face. Unfortunately poor Hope’s head was below the flow.